Tense, atmospheric, and reflective Australian crime novel. This is a bit of a peculiar situation. After reading great things about this novel and requesting the author’s second novel Force of Nature (you can check my review here) from NetGalley, I had to read it quickly to take part on a blog tour. When I looked at other reviews, there were so many comparisons to the first novel (although it can be read as a standalone) that I felt I should read the first novel to make my own mind up. That means I will be comparing the first novel to the second, rather than the other way around. Sorry. Why do things the easy way when one can complicate matters? There is no doubt that Harper knows how to set a story and how to take full advantage of the landscape, atmosphere, and characteristics of the place and the people. 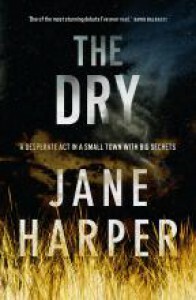 She sets the story during a terrible drought in Australia, specifically in Kiewarra, and has the main protagonist (who is also the main character in Force, Aaron Falk, a police detective specializing on fraud and financial crimes) return to his place of birth, twenty years after having left in unfortunate circumstances. The story is also told in the third person, mostly from Falk’s point of view, although we also have fragments, that are differentiated from the rest of the story by being written in italics, that go back to the events that happened many years back (the events that made Falk and his father leave town when he was an adolescent), and also to the more recent deaths. These fragments, also written in the third person, are told from a variety of points of views, although it is not difficult to know which character’s point of view we are sharing. (Some readers enjoy the style and others don’t, so I’d recommend checking a sample of the book before making a decision). In this story, Falk is called to attend the funeral of his childhood friend, Luke, who has seemingly killed his wife and young son, and then committed suicide, only leaving his baby daughter (13 months old) alive. Luke’s parents are convinced that their son has not killed his family and himself, and ask for Falk’s help. The current killings bring back memories of the death of a young girl who was Falk and Luke’s friend and with it the suspicions of his possible involvement. The mystery has some elements of the police procedural (as Falk joins forces with the new police Sergeant, Raco), also of the domestic noir (there are many secrets, mostly family secrets buried deep, and relationships that are not what they seem to be at first sight), and there are plenty of suspects, clues, red herrings, to keep us guessing. But the book does not follow a straight linear narrative, as I mentioned; it does go into plenty of detail about things that do not seem to be always relevant to the murders, and its pace is not what we are used to in more formulaic thrillers. It is slow and contemplative at times, and the past weighs heavily on the investigation (especially on those who have matters pending). Although most of the violence takes place outside the page, and this is by no means the most explicitly violent novel I’ve read (I’m difficult to shock, though), there is violence and it deals in pretty dark subjects, so be warned. 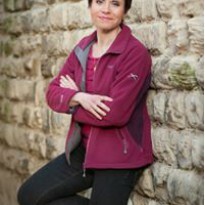 Whilst in some crime novels, even very dark ones, there are light and humorous moments that help release tension; there is hardly any of that here. What we have are insightful and contemplative moments, which go beyond the usual snarky comments by the cynical detective. I thought the small town was realistically portrayed. The envies, the resentment, the discomfort of knowing that everybody is aware of everybody else’s business, and the prejudices and the tensions in a place where nobody can hide, and where you are never given the benefit of the doubt, felt true to life. Although I’ve never visited Australia, the dynamics of the place and its inhabitants, subject to major tensions due to the uncertainty the draught had brought to the local economy, create an atmosphere that is tense and oppressive, even if the story is not fast-paced. The characters, in my opinion, are somewhat more clearly divided down morality lines in this novel than in the second, although it is not so evident in the beginning. Whilst in Force none of the characters come out of the book unscathed, and most of them are morally suspect, here there are good characters (although they might not appear to be) and some truly bad ones. Most of the characters (at least the good ones) carry a burden of guilt (in most cases for things they are not truly responsible for), whilst the bad characters seem unable/unwilling to take responsibility for their actions, no matter how cruel. As is the case for many investigators, Falk is also investigating his own past, and that is why he finds it so difficult to resolve the case. This process of rediscovery and personal digging will continue in the next novel. I would not say Falk is an immediately likeable character. I found him more consistent and easy to understand in the second book (of course, by then he had survived to the events of this novel, which would have had an impact on him), although he seems to come alive in some of his interactions with others (particularly Luke’s mother, a great character). Overall, I felt the mystery part of the story is more intriguing and well-resolved here (even though the past case keeps interfering with the present; there are not as many loose ends and red-herrings here), although I did not mind that aspect of the second novel (that I found more morally complex). For me, this one is more of a novel for mystery lovers, especially for those who prefer to take their time and enjoy a different setting to the usual urban thriller. The second novel in the series pays more attention to how the story is told and to the characters themselves. But there is no doubt that Harper is a great writer and I’m sure we’ll keep reading her and about her in the future. Ah, don’t miss this post with a recommendation of a book that people who have enjoyed The Dry might like (and I could not agree more. I love The Silent Kookaburra by Liza Perrat).